After our visit to The Druid’s Circle at Penmaenmawr we sidled off into the sunset heading inland cross-country to Llangernyw. I had a few random items on my agenda to work on, whereas I knew that for Kal this was the main reason for his visit. He was at an important juncture in his life and was looking to his old friend the archetypal “Tree” for some guidance. Having made contact with this helpful entity via the ancient yew tree at Llangernyw before, he was confident that he could do so again. For me, I had been guided recently to carve a symbol into my staff. I knew not why, yet. I’m sure that will become clear soon enough. For now, I wanted to confirm which symbol that should be before I started carving. On previous occasions when I had dowsed for this information it had been indicated that it should be the Dinas Bran sigil. This evening, as the sun was setting, I approached the ancient yew tree with respect and asked if I might dowse for some answers. I got a positive response and so began to do some dowsing. I dowsed at the edge of the tree’s canopy, on a flat section of ground indicated as a good place by the dowsing rods. I asked which symbol I should carve and began to follow a spiral pattern around from one side to another, in a familiar pattern. Was this like the ‘Bran the Blessed’ sigil? It was like that but the head was upside down! In fact it resembled the Arbor Low sigil too.I asked the rods if this was correct several times and they repeatedly said yes. When I sought an answer to this I got the impression that it was a symbol that was personal to me yet a reflection of both places, even literally a reflection in the sense of being upside down in parts. Were these stones and entrance or an exit? An exit. Were they for some form of energy (thinking back to Druid’s Circle) to be directed through? Yes. Was that energy spirit energy? Yes. Was it earth energy? No. 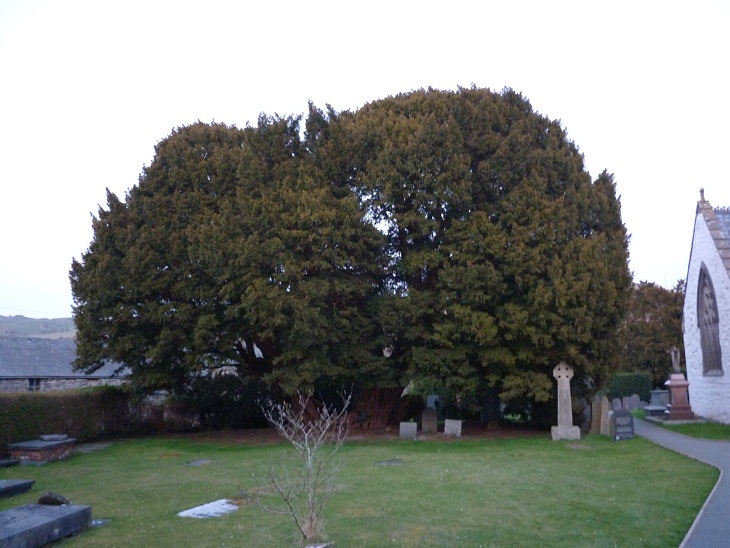 Was it the energy of the yew tree? Sort of – the rods came together slightly, but not firmly. Was it the spirit of the place that passed through this portal? Yes. Was this a good place for me to regain my fire energy? A strong yes. With that affirmation I went to go and sit on the flat tombstone behind the two stones, and immediately got a sharp pain in both kidneys. I took this as an indication that this was not a good place to sit! I stood between the portal stones, looking due west, and drew down the fire of the setting sun, as the saying goes in such circles. The rods confirmed what I felt – that this had been done successfully. Now I felt more ‘complete’ – like I had access to all the powers of Nature (except spirit, or aether, the fifth element). 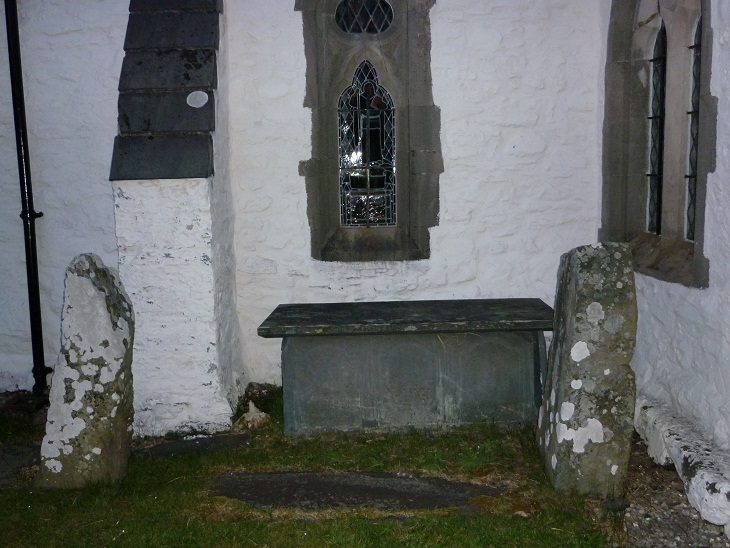 Whilst I was stood between the two energetic stones I felt like I could use that energy to get another burning question answered. I had one that was uppermost in my mind., The final task of the time between Spring and Beltane was to learn how to connect to the earth’s own energy grid. So far I had not one clue how this could be done, other than perhaps to be stood somewhere that neutral energy may naturally emerge, or something like that. I decide to seek some guidance, any clue at all. I asked the yew tree to help me to imagine what I should do to link to the neutral earth grid – and I was shown several places very quickly that I couldn’t make out because they were too quick. Then I was shown an image of me nestling into the bosom of the earth – literally two small humps of grass between which I was curled in a foetal position, soothed and sleepy. I was to find a place where I felt that comfortable and then bathed in warmth and comfort I could connect to the earth’s own energy system and draw upon the neutral energy – the pure energy of the earth. I was amazed at the wonderfully intuitive way the information was given to me, and extremely grateful to have been shown this vision. Now, all I had to do was to find such a place…. I thought I was finished for the evening – hey, hadn’t I got everything I came for and more? I certainly had. Kal popped around looking pleased with himself and his exploits, which I intended to ask him about as soon as we were on the road again. “Have you finished?” he asked me. “Let’s ask the rods!” I quipped, expecting a ‘yes’ response. I got a ‘no’. Apparently, there was more! 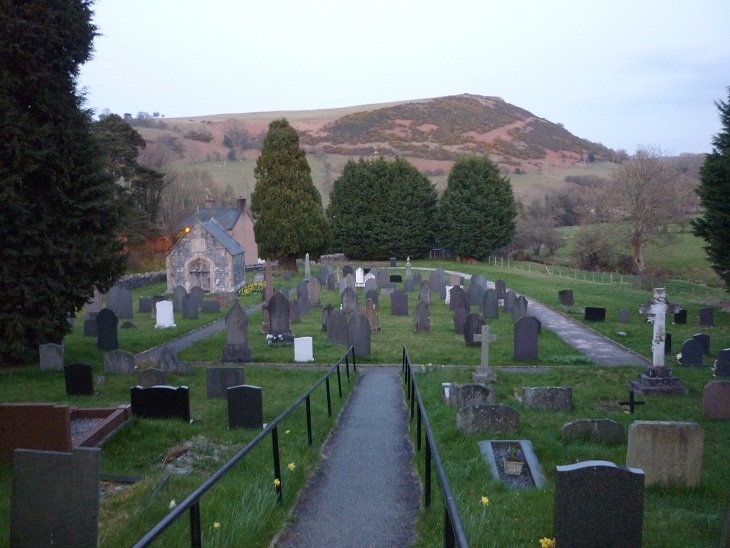 I asked the rods to take me to the place where I could find out about this other information, and soon I was walking along the side of the graveyard, past gravestones, until the rods swung back on themselves to point to a grave close to the edge of the path the surrounds the lower site. There was an inscription on the gravestone. I read, “Oft in danger, oft in woe“. i thought this was very unusual inscription, as I had never seen anything like it before! It was the inscription that was important. It took me several minutes of narrowing down the field before I hit upon the relevance of these words: it was to do with me not putting up energetic protection when I visited sacred sites. I had become too complacent and trusting, relying on my intuition to warn me of potential problems. So far I had been lucky and had visited sites when no-one else was around which has prevented problems so far (apart from one episode that really stuck in both our minds of an encounter at Llandrillo). Now, as I moved into the warmer lighter months I was being warned that other people may cause me problems unless I protect myself appropriately when I go out in the near future. Memories came flooding back and I felt I knew what was being suggested. I asked if that was all? No, there was more. Again I let the rods take me on a little wander, this time only ten or fifteen feet away from where I was. The rods swung dramatically again to point at what seemed like an ordinary grave of a couple. Again it took me several minutes to divine the answer through a series of questions and response. The couple had been “energetically aware” people, but had died due to some misfortune brought about by an encounter with some form of deviant spirit energy. This was a stronger re-enforcement if I needed it, and I will heed the warning and will be more careful from now on, especially in the presence of other people, whether they mean harm intentionally or not! All in all, a strange end to the evening for me. For Kal, however, the evening had been highly positive. He had received advice from the yew tree that he should ride out his current issues without trying to resolve them for himself. They would all, apparently, be taken care of – despite how impossible that seemed at that time. A week later everything righted itself against impossible odds and in quite incredible circumstances. Never would we doubt the power of this tree, or its influence over this churchyard! Oh my god! This tree is so powerful. 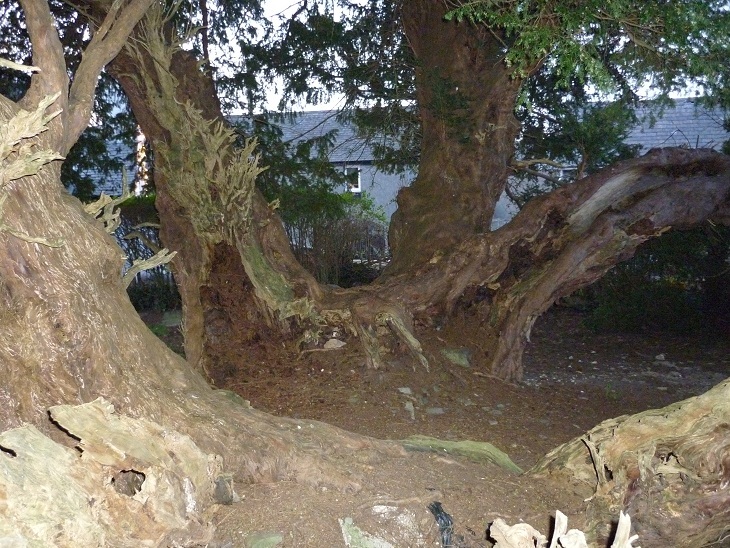 I felt the power when I viewed the photograph taken from inside the Great Yew. This site is absolutely fascinating I have just love the intuitive and absolute connection with the earth powers. It makes me aware of the web of energy that connects, interconnects and spirals us all into a vast vortex of energy. I am still reeling!